Our thanks to Sue Griffin for inviting us to spend the morning of Good Friday painting her lovely, multi-level gardens…not a cloud in the sky, perfect temperature, sitting in the shade…it doesn’t get much better. The original house on a small lot was purchased in 2004 with two additional lots purchased to make room for house remodel and garden expansion. Joseph Turner, a noted San Miguel landscape architect, designed the garden spots that flow around the house as well as the many exuberant plantings in pots on the second and third levels. Linda and I had difficult decisions to make about where to paint…so many good choices. The portico immediately off the main rooms of the house has a view of the water feature and the three Silver Queen Palm trees. Columns provide a most attractive frame for a painting as Linda so nicely shows. Around the back of the house is a private patio that can be accessed from the master bedroom and kitchen. Sitting in the shade on this patio gave me a view of the magnificent Pirul or Peruvian pepper tree which was saved during construction. The painting doesn’t do justice to the size of this handsome old tree. It’s protected by a decorative rock wall covered with pomegranate vines that will soon add large splashes of color to this part of the garden. In addition to a variety of greens and blooming flowers around every corner, Sue has artful placed decorative statues, carvings, and unusual objects here and there creating a garden full of pleasing vignettes. Sue and her two dogs aren’t the only visitors to this garden. In the last two or three years her larger dog, Litibu, has captured 16 tlacuaches (opossums). I say “captured” because, as Sue has found out, not all of them are dead…just playing possum. That brings us to chapter 2 of the hummingbird story which connects Sue’s garden to the Anton’s garden featured in the previous blog. For anyone who has not read the first installment, you can go to The Tale of Two Gardens…Chapter One. Hummingbirds frequently nest in Sue’s garden. 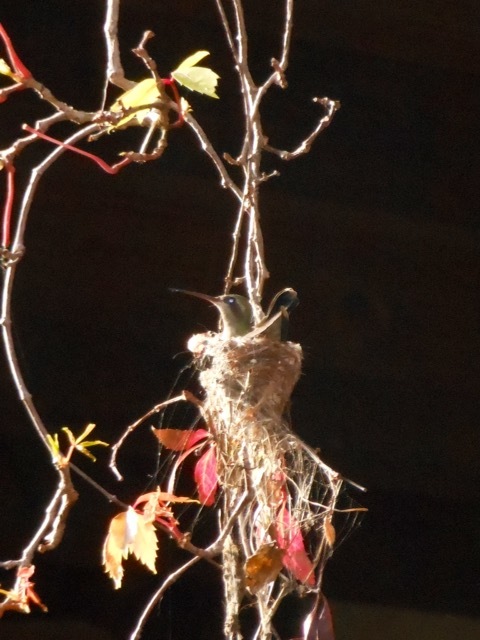 At the same time that Kambria had the ill-fated nest in her olive tree, Sue had a hummingbird family in the Virginia creeper vines trailing from the second-floor railing. Luck would have it that Sue put a picture of them on Facebook which Kambria saw. Kambria, tiring of the nonstop feeding requirements (1 to 3 times an hour) of baby hummingbirds, decided to try a daring strategy to save the baby birds. She took the olive branch with nest and babies and tied it to the vine near Sue’s nest. The mother, at first, didn’t seem to be feeding the new babies so Kambria repositioned the nest as close as possible to Sue’s nest and admonished the mother hummingbird to please feed her new babies. She did and all four babies successfully fledged. Sue thought there may have been as much as two weeks difference in age between the nestlings. Baby hummingbirds are in the nest for about three weeks. Thus ends the amazing Tale of Two Gardens…..